FUN Fact #1: Despite common usage in annoying commercials or movies, mushers do not say "Mush" to their dogs. Where did this come from? One theory is that French trappers were overheard saying "marche" to their dogs. 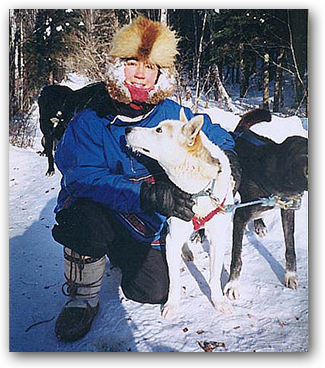 The term "musher" stuck and is used to describe someone who runs sled dogs. FUN Fact #2: In the winter, most mushers bait the water they give to their dogs so the dogs drink it before it freezes. A bucket of water can be laced with bloody meat parts of various origins, making it look a little like a horror movie prop with floating globs of goo. Mushers also like to gross out their friends by asking them to ladle it out to the dogs. But, watch out for the dog who has this all figured out and tips their bowl over to eat the chunks off the snow. FUN Fact #3: One of many things a leader must know is their right, "gee" from their left, "haw." These commands have been around since teams of oxen were used to plow fields. But the best leaders will understand subtle uses of these commands such as "gee over" to get the team to hug the right side of a trail. This can be used to allow a snowmobile or another team to pass. 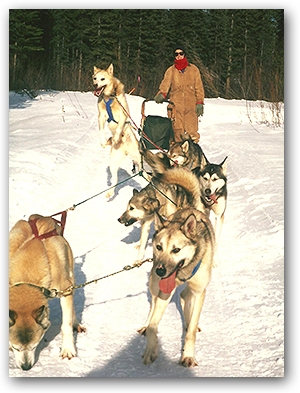 I once ran with a musher who used a blind lead dog. They were so tuned in to each other, the musher could whisper, "gee, gee, gee" and the dog would veer farther right with each use of the word. I'll never forget seeing the dog charging down the trail and then unquestioningly leap off mid-stride after hearing, "GEE!"